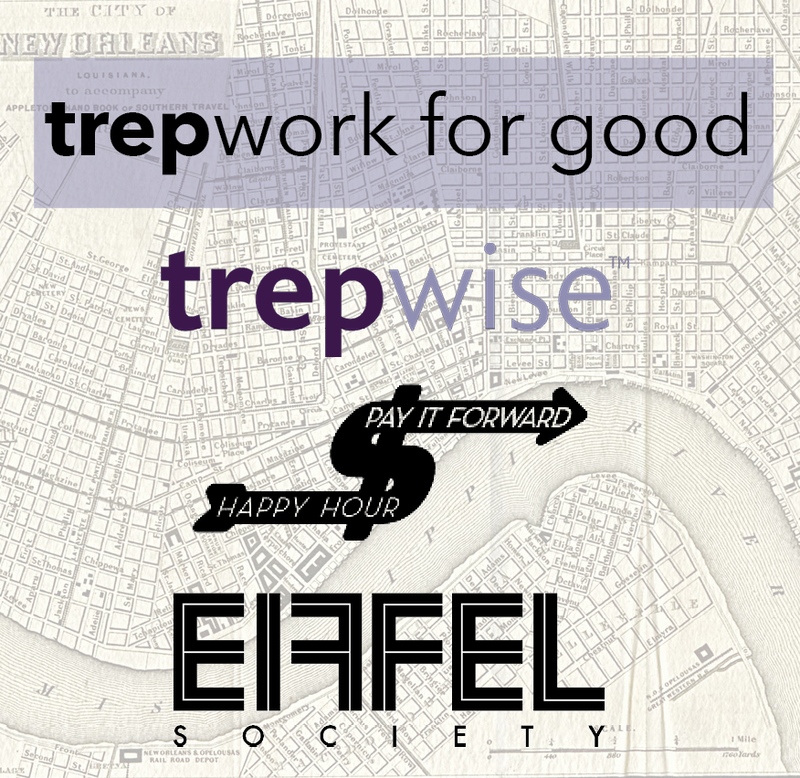 New Orleans (August 2018) – Local consulting firm, trepwise, is partnering with Eiffel Society to co-host “trepwork for good” – a philanthropic event series highlighting eight local non-profits with four “Pay it Forward” Happy Hours, one each month from August through November, to increase awareness and fundraising opportunities for each participating organization. The “Pay it Forward” Happy Hours will take place at Eiffel Society, 2040 Saint Charles Avenue, once a month from 6 to 8 p.m. showcasing two local non-profits at each event. Happy hour prices will be available all night long with $3 beers, $5 house wine, $6 well cocktails + signature cocktails specials. Come thirsty as 20 percent of the bar proceeds will be split by both organizations, which will also be collecting suggested donations at the door. Each organization will have the opportunity to address the crowd and bring their own fundraising tactics to each event. All trepwork for good events are FREE to attend (although charitable donations are always encouraged) and are all-ages, so bring the family. The first “trepwork for good” event will have a “Back to School” theme and will be held on be Tuesday, August 21 from 6 to 8 p.m. showcasing two education-based non-profits, Brothers Empowered to Teach and STEM NOLA. Guests can enjoy “The Bruh” – a rum-based specialty cocktail for only $7. 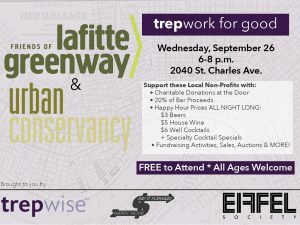 September’s theme is “Community Sustainability” and will support the Urban Conservancy and Friends of Lafitte Greenway on Wednesday, September 26, from 6 to 8 p.m. The following month, arts and culture organizations will be the focus of the happy hour event with the Arts Council of New Orleans and the Louisiana Philharmonic Orchestra taking the spotlight on Wednesday, October 24, from 6 to 8 p.m. 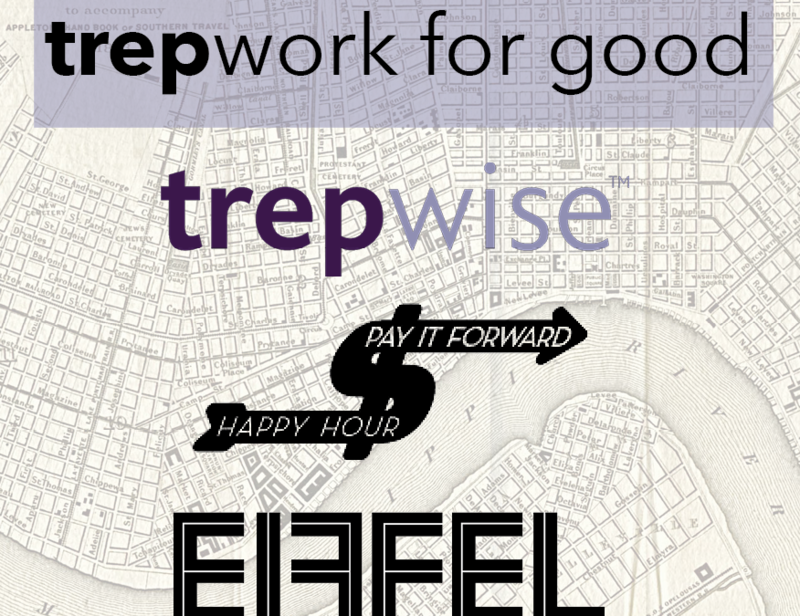 The final “trepwork for good” Pay it Forward Happy Hour will be Wednesday, November 14, from 6 to 8 p.m., with the theme of “Feed it Forward” in the spirit of Thanksgiving and will highlight Love & Action Outreach and Broadmoor Improvement Association, both of which have food banks that serve the community.